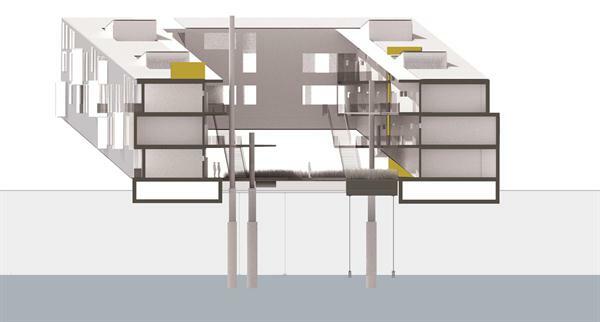 SHIFTboston blog» Blog Archive » Floatyard – housing for hurricane prone areas. How would you solve the problem of creating housing in areas that are susceptible to hurricanes? Design firm Perkins+Will recently submitted a design that won a 2013 P/A Award. Their design proposes a floating multifamily housing on a 72,000- square-foot pier in Charlestown, Mass., at the edge of Boston Harbor called, Floatyard. Ed Nardi, President of Cresset Development also worked with Perkins+Will on the Floatyard design recently spoke with SHIFTboston and told us more about the project. SB: What was your process and inspiration for designing the Floatyard? Ed Nardi: As a developer always thinking of creative housing typology in order to create buzz and interest from perspective renter/buyer; specifically the idea of floating housing was borne out of a visit to Amsterdam and seeing some of their floating townhouses along the inner harbor that were new to the area and of course their barge housing which is scattered throughout the canals in the city. Unique housing like this would be very popular – and given its inner city location cars are not a primary concern but imagine pulling your boat up to the side of your residence! SB: If built, where are other areas in Boston or on the coast that could benefit from this type of housing? Ed Nardi: Harbors are the best bet for obvious reasons of building on waters that are relatively protected but also have the utility infrastructure to tie into. Fortunately the pricing is really unit driven by count so the concept could be easily sized up or down given the size of the watersheet area. The units can easily be built offsite – which could promote significant savings when one considers the significant premium for union labor in certain core markets and would ultimately have to be reasonably negotiated. The finished units on barges that would then be floated into place and anchored by a series of pilings that allow the housing to float with the tide. We would envision from 6 -12 units of housing per barge. SB: What are the qualities of Floatyard that make it able to withstand hurricanes and major storms more so than traditional building structures? Ed Nardi: I am not sure that the physical structures would be any better than conventional land based housing as to withstanding significant wind loads given the structures would be identical as to following standard building code requirements and presumably best engineering practices. However, I believe they certainly could weather any storm surge better than adjacent structures since the concept is barge based and the housing on the barges would simply rise with the tide and not be prone to flooding – certainly water rise and flooding create far more damage than wind in recent hurricanes. There is no basement structure to worry about and all utilities would be above the ground floor line in the units. SB: How receptive is the city of Boston to building housing like Floatyard and is it a possibility for it to be build soon? SB: Where (if any) are there other locations that currently use structures that may be similar to Floatyard? Ed Nardi: I do not know of similar applications to Floatyard but certainly Seattle and California have floating housing stock but limited to two stories I believe, Amsterdam is the largest application of larger scale housing that I have seen to date. SB: In your opinion, are other parts of the country or world more open to designs like Floatyard being build – please explain your answer. Ed Nardi: Apparently yes as noted above, change doesn’t come easily in Boston which isn’t necessarily a bad thing. An exacting permitting process coupled with tough local politics and abutter concerns tend to make Boston a “high barrier” city but respectfully it tends to limit overbuilding, promote better planning and architecture and hold higher value but, it does come at a cost of limiting new and innovative ideas in the built environment. When one overlays these typical permitting hurdles with Chapter 91 restrictions as to building adjacent or over the water it can appear very daunting but there is a path to “getting there” – it just requires a fair bit of diligence and a lot of patience! Click here to read the story behind Floatyard. Well this is exciting!… The Boston Waterfront has miles of under-utilized frontage where such concepts could “take root” on the watersheet. These include the Mystic, and Little Mystic Rivers, Dorchester Bay, and to a lesser degree Fort Point Channel and the Charles River. Salem, Quincy, and the Providence area have ample frontage too. Good luck -its innovative, environmentally sensitive, and potentially affordable.